Scientists have uncovered what they believe is a worrying new trend of more older Aussies drinking alcohol at "problematic levels". 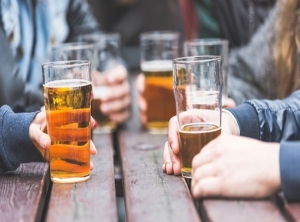 Not only is there an increase in the number of older drinkers in the past year, but more are also drinking at concerning levels, researchers from the National Centre for Education and Training on Addiction at Flinders University reveal. Data from the National Drug Strategy Household surveys show that among people 50 years and over, the proportion with an alcohol intake deemed risky has fluctuated, from 13.4 per cent in 2004 to 13.5 per cent in 2016, while the high-risk group has increased from 2.1 per cent to 3.1 per cent. The increase is in stark contrast to a "significant decrease" in risky drinking among people aged 12-24 during the same period, according to the Medical Journal of Australia. The study also shows there has been an increase in the proportion of older people abstaining from alcohol but not to the same degree as younger groups. The researchers said older Australians who drink too much are at risk of falls and other injuries, diabetes, cardiovascular disease, cancer, mental health problems, obesity, liver disease, early onset dementia and other brain injuries. "Although the increases in the proportions of risky and high-risk drinkers are small, they nevertheless correspond to an additional 400,000 people drinking at potentially problematic levels," the study states.